RIO DE JANEIRO: Flash floods caused by torrential rain killed at least three people in Rio de Janeiro, officials said Tuesday, as emergency workers raced to rescue people trapped in buses, cars and buildings. Heavy rain overnight inundated parts of the city, turning some streets into raging rivers, toppling trees and sweeping away cars as the state emergency agency declared a crisis. The southern zone of the city, which includes Copacobana, Ipanema and Leblon as well as several favellas, was the hardest hit. 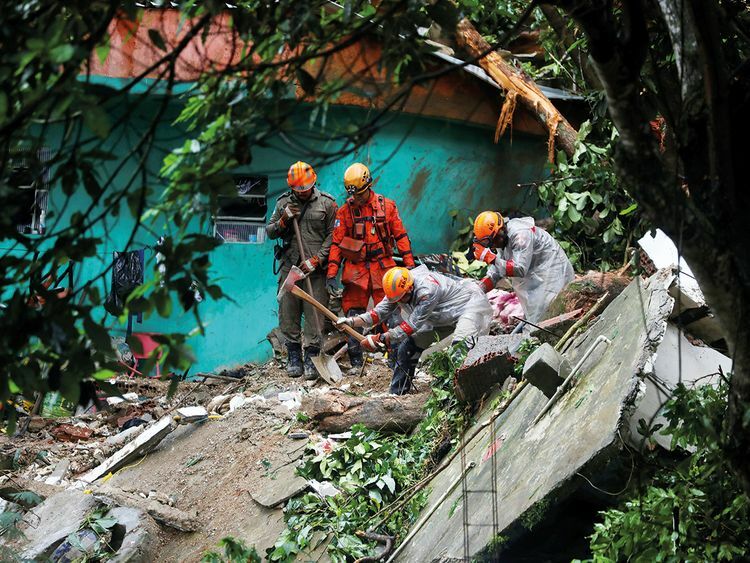 A man was killed after he was caught in flooding, while two women died when a house in a favella collapsed, Rio de Janeiro mayor Marcelo Crivella told reporters. At least one person is missing, G1 reported. “Many houses in Rio are built in areas that are inappropriate, in places where water flows. It4s a tragedy and we have tried to warn these people,” Crivella said. Heavy rain often causes flash flooding in Rio de Janerio as the volume of water overwhelms the city4s creaky infrastructure and brings traffic to a halt. Impoverished favelas spread across hills throughout the city are usually the hardest hit. Torrential rain in February killed six people in Rio de Janeiro.